One of the few early maps to detail the original seven islands of Bombay. Carte de la Cote de Guzerat, du Golfe de Cambaye et des Cots de Concan et de Canara. 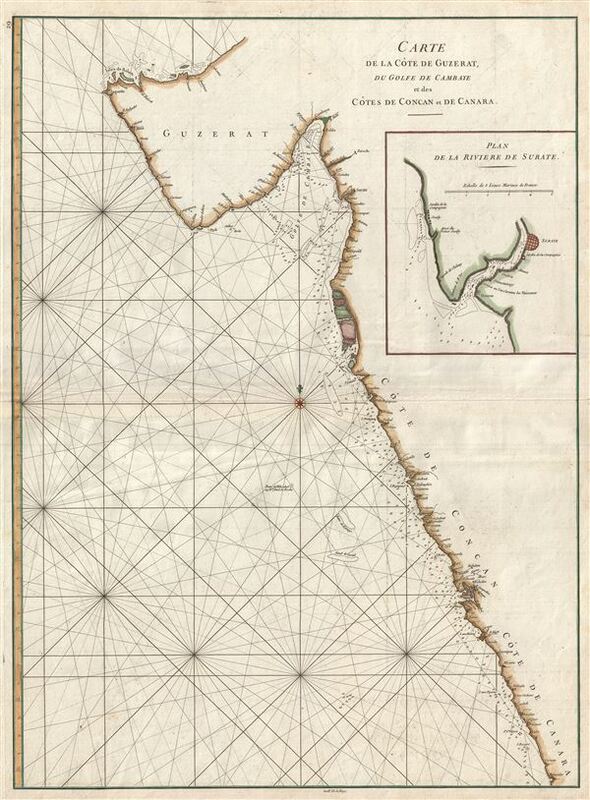 A scarce 1775 nautical chart or maritime map of the coasts of western Indian in the vicinity of Bombay (Mumbai) and Goa. Composed by Jean-Baptiste d'Apres de Mannevillette, this map covers from Gujarat and the Konkan coasts, from the Bay of Cambaye (Gulf of Khambhat), Surate, and Bombay, to Goa and the Coast of Kanara. One of Mannevillette's most important charts, this map offers significant updates over most earlier charts, with countless soundings and corrections. This is most significantly one of the few maps to illustrate the seven islands, now connected, that compose modern day Bombay or Mumbai. The practice was abandoned only a few years later as the water passages between these islands began to be filled-in or silted-up. The map offers rich detail including countless depth soundings, notes on the sea floor, commentary on reefs, rhumb lines, shoals, place names and a wealth of other practical information for the mariner. This chart was drawn by Jean-Baptiste d'Apres de Mannevillette and engraved by Guillaume-Nicolas Delahaye for publication in the 1775 Neptune Oriental. Very good. Minor printing press crease left side, near centerfold.